The petunia is a popular flower that shows best in the late spring and summer. It is in the genus of solanaceous herbs whose leaves are delicate. You can find multiflora and grandiflora varieties that can be spreading or trailing. The flowers come in many hybrids and can be found in a multitude of colors and variegation. The root structure is sensitive to cold temperatures and they are generally considered an annual due to the damage caused by frost or persistent cold. Petunias are a fragile flower whose planting time should be dictated by the last frost. In Northern areas, this will be around May. Southern plantings can be accomplished at any time as long as the temperatures remain above freezing and they are used as tender perennials in these zones. Ideal temperatures are 60 degrees F at night and 70 degrees F during the day. The flowers tolerate partial shade but do best in full sun. Although cool temperatures don't bother the plants in the short term, very cold temperatures can damage the leaves and even kill the roots. Like all plants, petunias need their vascular system to support nutrition movement in all parts of the plant. Delicate cells in the leaves are part of the vascular system and support photosynthesis, a process that uses the sun's energy to convert carbon dioxide into sugars. Extreme cold can damage the cells and freezing can cause them to burst, killing the cells and the surrounding plant tissue. 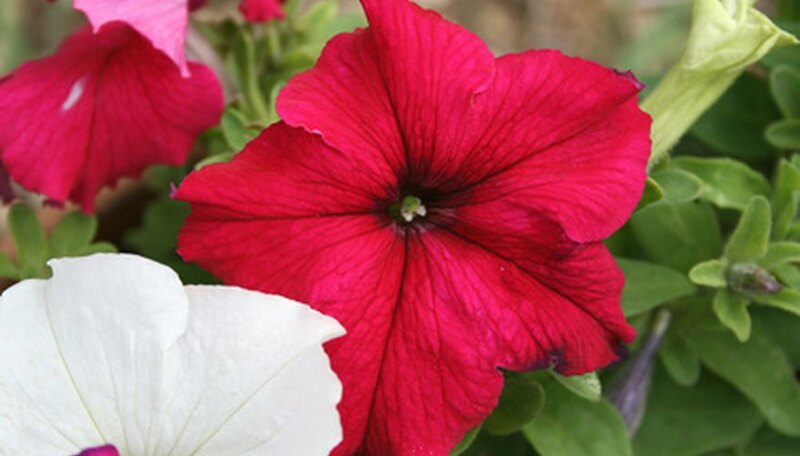 Petunias that have been exposed to frost will develop whitish edges on the leaves and the petals will wilt and droop. The petals will also "melt" right off the flower if the cold is combined with moisture. Nighttime cold temperatures can add too much moisture around the stem causing damping off, or a rotten stem where the plant falls away from the root. This will kill the plant. Cold temperatures will also cause leaves to fall off and any new growth can burn and die. Petunias can be protected from cold damage to some degree. If temperatures are forecast to drop into the 50s or lower, pile dry leaves, straw or mulch around the plants. Frost bags or cold bags can be tied around the plants to give them a warmer environment. You can also use a plastic bag to create a similar habitat, just remember to remove it when temperatures climb back up. Petunias do well as container plants, so this is an easy way to protect them as the pots can be moved into a sheltered area when temperatures drop. It's hard to wait until soil temperatures are around 60 degrees F to plant spring color. The Laura Bush petunia has been engineered to be more cold tolerant than other varieties and can survive and bloom until the first freeze. The variety is also more pest resistant and comes in many colors. University of Toledo scientists have gone even further by planting a gene from a cold hardy weed into petunias. The resulting plant can tolerate light freezes and very cold temperatures that would kill a normal petunia.